I admit that my children are growing impatient with my taking photos for this project; I think I’d have to buy a new backdrop to get them excited ;) So for April many aspects of this project are different than other months. 1. I couldn’t convince all my boys to get an entire roll. In fact, I couldn’t even get one of my kids to cooperate for an entire roll in one sitting so the roll is more of a survey of the month. Some are in “studio”, others around the house, and the last ones at a playground. 2. This month only features my littlest because he’s the most cooperative and he’s home with me all day so there are more opportunities. 3. This set is in black and white, which I realized none of my others have been! I absolutely love black and white but for whatever reason haven’t been using it for this project. This set was shot on my Nikon FE and self-developed in HC-110b (If you want to learn how to develop your own black and white, click here!). I’ve been trying to force myself to pick up my FE more often because I realize my muscle memory for manual focus has gone down the drain and I’m wanting to force myself to recover that. I only had a 50mm and 85mm that worked with this camera, so after Christmas I went out and got a new-to-me 24mm 2.8 for those moments I needed a wider view and so far I am loving this, little $70 lens! These were shot on Kodak TMax 400 at 1250 and pushed 2 stops in development. It’s the end of March and finally the sun is giving off its warm, spring light and copious amounts of snow are in the process of melting. After a pretty brutal winter, 45 degrees is feeling more like 70 and the children of Minneapolis are hopping on their bikes for the first time in months in spite of the lingering remnants of winter. Fingers crossed April’s project will be shot more outside (not because I don’t love my studio set up but because my kids - and possibly you - are getting sick of it.). But for now, enjoy a BRAND NEW BACKDROP that actually has color! Once again I totally “cheated” on the One Roll, One Kid parameters of the project. 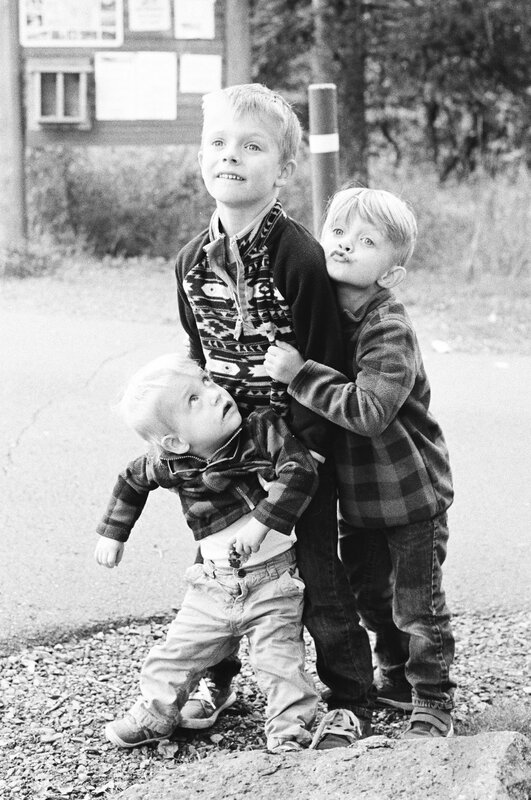 This time I photographed all three of my children on 1.5 rolls of film. 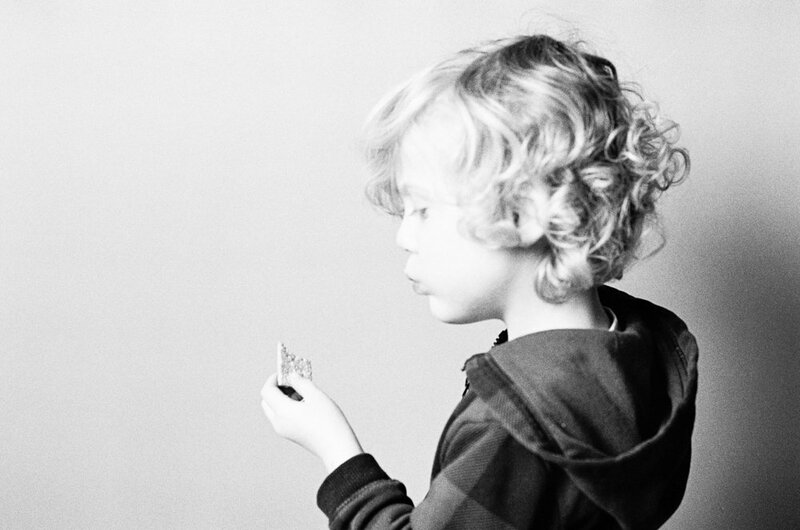 AND when I was photographing my eldest, the littlest walked into the frame and they had some moments together. I included those because they’re too cute. I also know when to pick my battles and with how reluctant my kiddos were, I allowed them to wear their pajamas for the shots. This means there’s ALL THE COLORS in these shots, which is a little shocking to the eyes, so beware. The films I used were Kodak ColorPlus 200 (rated at 200) and Portra 160 (rated at 160). The ColorPlus turned out way more saturated than I expected and I’m not in love with it, while the Portra 160 is just exactly as I hoped it would be. Portra 160 is one of my FAVES and I’m loving experimenting with it outdoors, with strobes, and pushing it. It’s versatile and skin tones always turn out sooo pretty! There’s a whole, amazing crew participating in this challenge in 2019, so be sure to check out Charlene Hardy‘s March contribution! I was engaging in a discussion with some other photographers about our intention when creating portraits , especially regarding commissioned work, and it suddenly dawned on me that although I have given my own intention A LOT of thought, I don’t communicate it. I try to communicate it through my portfolio but it’s helpful to read what these intentions are. Hiring an artist is an investment and it should be my job to give you information so you know you’re making a choice that’s a good fit and ultimately worth your hard-earned money. Any time you hire a photographer you are commissioning her to create art. And because art is subjective there is no one-size-fits-all photographer. Photographers range from studio to on-location, strobes to all-natural light, film to digital, light and airy to dark and moody and all the greys in between. So where do I fall on the spectrum? These are probably the things you DO see in my portfolio but it’s worth mentioning them. I do most of my work on location, either outdoors or in-home. I always shoot with natural light at outdoor sessions and use a strobe (think the flash from school picture day) for in-home sessions that need an extra boost of light. I had to use a strobe at this in-home session on a classic Minnesota dreary, winter day. Strobe makes it dreary-no-more! I am an all-film photographer who loves vibrant, warm colors but also a rich, contrasty black and white shot, so I wouldn’t label myself as either light and airy or dark and moody. Now on to the particulars you might not know about my commissioned work. I take creating art for you very seriously and it has taken me years to refine my goals and how to achieve them at a session. I don’t see that refining process ever being complete during my tenure as a photographer; as I change and mature and study I know it helps me hone in on what to achieve and how to approach sessions. 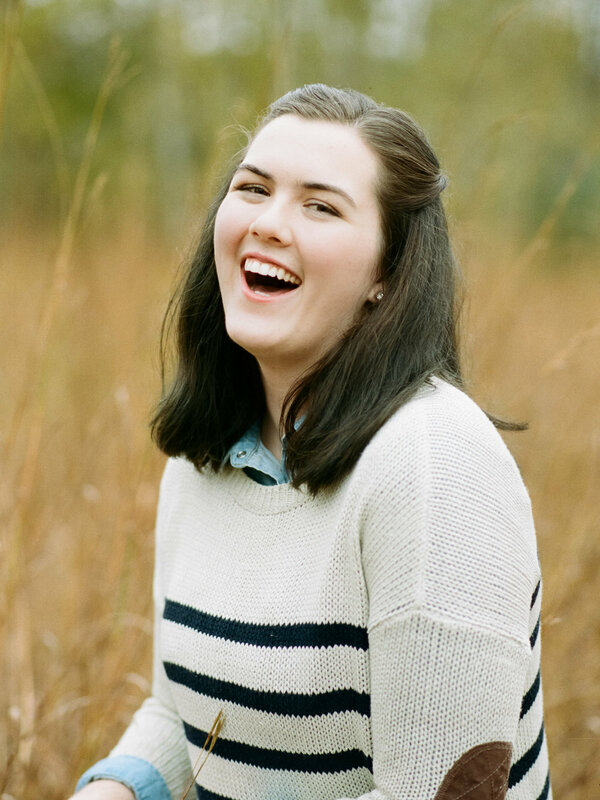 Headshots are their own beast so the rest of the journal will be specific to seniors and family sessions. 1. I want to capture the smiling, everyone-look-at-the-camera shot. It doesn’t excite me creatively but it is SO, SO IMPORTANT. For seniors this would be the classic yearbook shot and for families this is the shot where you can see everyone’s face; it will be passed down the generations because it documents who was there and what they looked like at the time. I don’t spend a lot of our time getting this shot, and although I might revisit this shot a few times during our session, I will only include a few of them in your gallery (more for seniors so they have a perfect yearbook option). I don’t see a need for 20 of these from a single session. To me, this shot is akin to the “vacation shot”. You know, the one where you want to make sure you document the family vacation so you hand your camera off to a stranger and cheese. It’s a super important one to have but you don’t need a lot of them and basically anyone can do it. 2. What excites me are the emotion-filled shots and these are the bulk of what I shoot and deliver. A high school senior spinning, feeling excitement and trepidation on the precipice of adulthood. A mama smelling her new baby. Siblings fighting and laughing. A father swinging his little boy who is growing all-too-quickly. These are the shots that tell a story. Because I am not a documentary photographer, I come into sessions already having something to say about being a family, having a newborn, being a high school senior. BUT lest you think my vision will supersede your reality, think again. I could (I don’t, but I could) have the exact same shot list in mind for every single session and no two sessions would turn out the same. At each session, I intersect with you. I bring my intentions and you provide your own dynamics and that’s where the art is made. 3. I also like to try to leave room for some experimentation. This could involve shooting a roll specifically so that I can try a technique on it (maybe fogging it or doing film soup on it.) It could mean shooting some new double exposures or funky posing I have in mind to communicate my thoughts on family or high school. But no matter what it is, I view these as in addition to category 1 and 2. Sometimes they don’t turn out but when they do I feel reenergized as a creative, so I do my darnedest to try to fit some experimentation in. What excites me about the second and third categories is that this is what I want to hang as a giant canvas on MY walls. The smiling shot matters but the commissioned art comes in the latter categories. I want the emotion filled, light leaked, film souped, blurry love hanging on my walls. That’s the stuff that speaks to real life, tugs on my heart, makes me think. These are the shots that can only be created when you and I come together to make art. I was recently talking with my husband Dave about a friend who is pregnant and he asked me “Do you think they’ll get newborn photos?” I was a little surprised by this question and I responded that I had no clue, but then I asked him if he thought they should. I admit I was taken aback by his adamant response that they absolutely SHOULD get newborn photos. Now, don’t get me wrong, I obviously find newborn photography important but I was just a little surprised that Dave felt the same way. We’re not known for luxury or frivolous spending, but as someone who has completely bought into the value of photographs I view sessions with the right photographer as a luxury but most definitely not frivolous. I realized he felt the same way as he started to go off about how important newborn photography is. Before having children I would bet that he would’ve thought newborn photography rather unnecessary, but now that our children are 7, 5, and 3 we have hindsight to our advantage. There are many reasons to get newborn photos, but in this entry I will highlight the top 3 reasons Mr. Berge and I found as being the most important. As Gretchen Rubin said “the days are long but the years are short”. After having a baby, my friend awoke to her husband talking in his sleep and he was saying “slong.” In his dream this was the word he was using to talk about the contradiction of this time of life. They change so darn quickly. Before you know it your newborn will be a baby and your baby will quickly turn into a toddler. Within 6 months you will have forgotten just how small your baby was at birth. 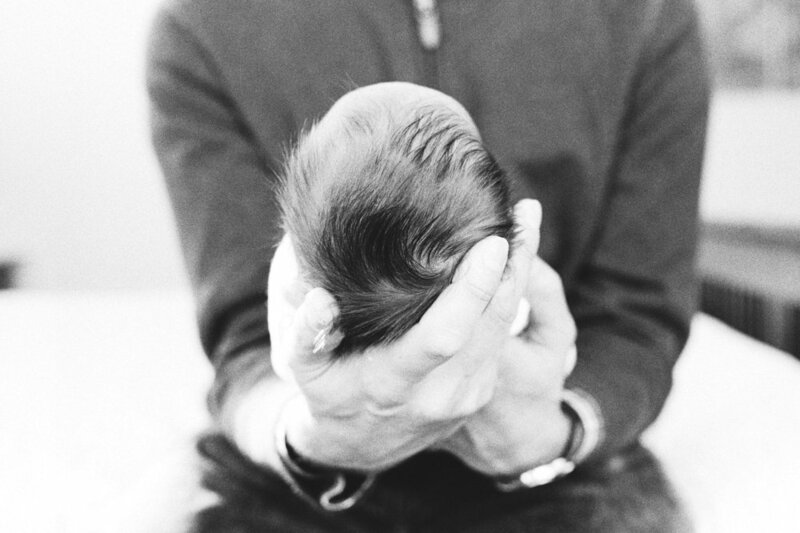 Without photos you’ll forget that soft tuft of hair she was born with, the expression he gave as soon as you picked him up, the way she constantly calmed down when you swaddled her. Because before you know it your baby won’t be this same way anymore and it’s my job to capture it before it’s gone. That being said, if you’ve missed getting newborn photos within the first couple weeks, do not let this deter you, but I encourage you to book now. Even if your sweet baby is 1, 2, 3 months old he still has plenty of changing to do for the rest of his first year. Those things he does and the way he looks at 2 months will quickly become distant memory as he turns 6, 9, and 12 months. Capturing your baby at any time in the first year is a good thing! They want to know their story and you want to remember it too. Let’s be honest, those new baby days are blurry ones. I had to remind my husband how he would walk or drive one of our babies around just so I could get some sleep at night—he had actually forgotten he did this! I am completely convinced if I hadn’t taken so many photos even more memories would be forgotten. Photos have a way of preserving memories and at this time of life you need all the help you can get. 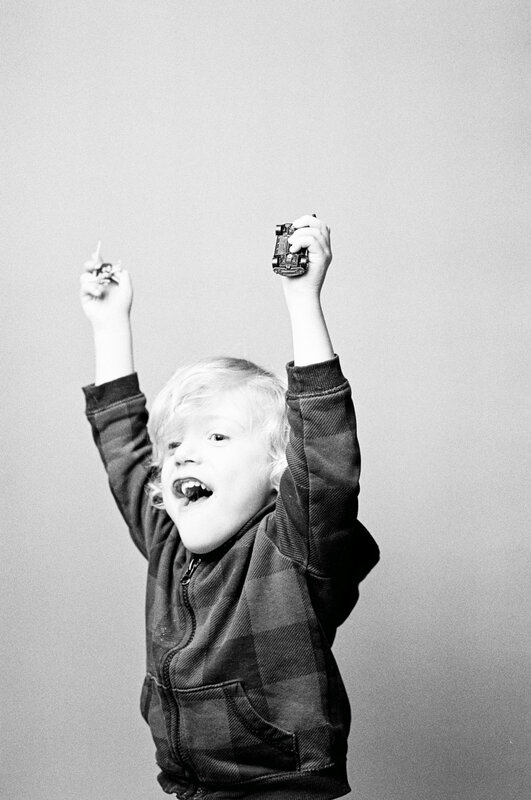 Having photos helps you remember and retell the story of your kiddo’s beginning. My boys each love picking up his baby book, perusing through the photos, and hearing about how fussy he was, how much he loved his brother, and the way he ate his carrots. But even more importantly, when children look at photos of themselves with their mom/dad/sibling they see they’re loved and that they belong. That’s their story and they love seeing it. For over a year my only backdrop has been Storm Gray Seamless Paper by Savage but I want to buy alllll the colors, so this month I branched out and invested in Pure White. (Spoiler alert: I bought an actual color, which recently arrived, so don’t worry I’m not all whites and greys.). I am fortunate enough to have a local photography store that I bought this from so it was instant gratification. I shot off a roll of Portra 160 on my Nikon F100 and developed it the next day. 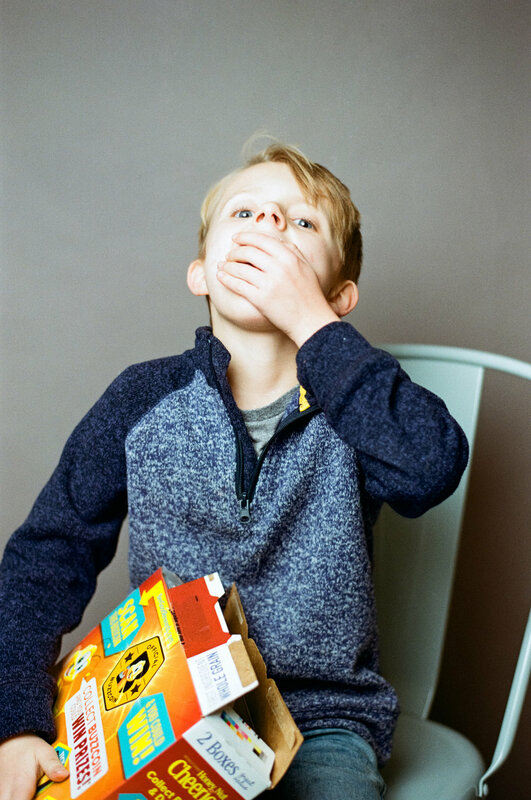 Just like in January, I kind of broke the rules this month, but this time I just shot all three of my kiddos on one roll. But I photographed them one at a time, so I feel like I followed the spirit of the project, ya know? If you’re wanting a list to my studio supplies, you can find them in my January’s One Roll, One Kid post! There’s a whole crew of us doing this project in 2019; click here to check out Dena’s February post! I feel the need to preface this entry by saying this: we all have different tastes and styles and that’s a good thing. Just because I connect with a style doesn’t mean you will or should. The purpose of this post is to share my own experience as a photographer and to connect with others who feel this style fits their own needs. It’s no secret that I love in-home lifestyle sessions. “In-home” being just that, photographing in a client’s house. 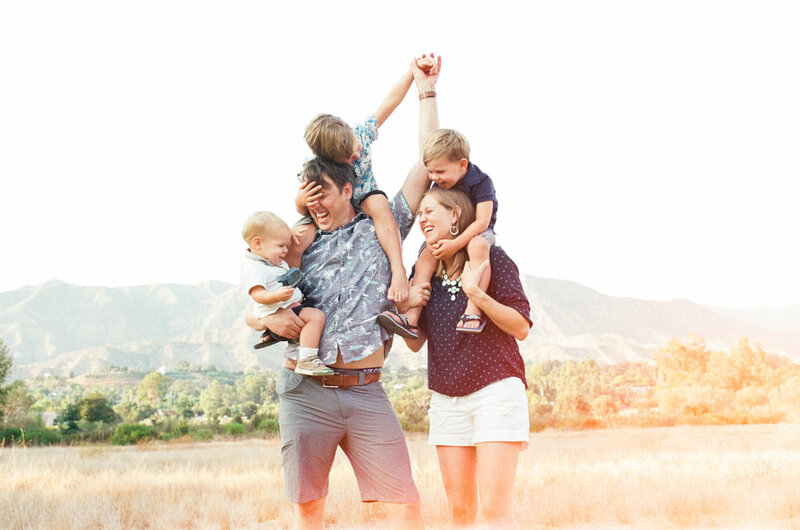 “Lifestyle” meaning photographing the story of your family through purposeful posing to elicit emotions and capture connections. But what you may not know is that in-home lifestyle is the only way I currently capture newborns and it’s my very favorite way! If you’re considering what style is best for your newborn session read below to find out why I absolutely love in-home lifestyle newborn sessions. 1. You don’t have to go anywhere because I come to you. Who’s kidding who, when you have a newborn leaving the house is a chore and you run the risk of forgetting to pack something. Being in your house means you never forget anything. When we were taking family photos with our eldest for Christmas cards, we got to the site and he immediately had a blowout. We hadn’t thought to bring extra clothes because in his five months of life he had never had a single blowout. We immediately had to turn around and head home to change. So believe me, I understand the importance of being near anything you need during a photo session with a baby. 2. Doing lifestyle, baby-led posing means everything just feels more relaxed. We don’t have to stress over how long it will take for your baby to fall asleep so we can pose her in just the certain position we have in mind. 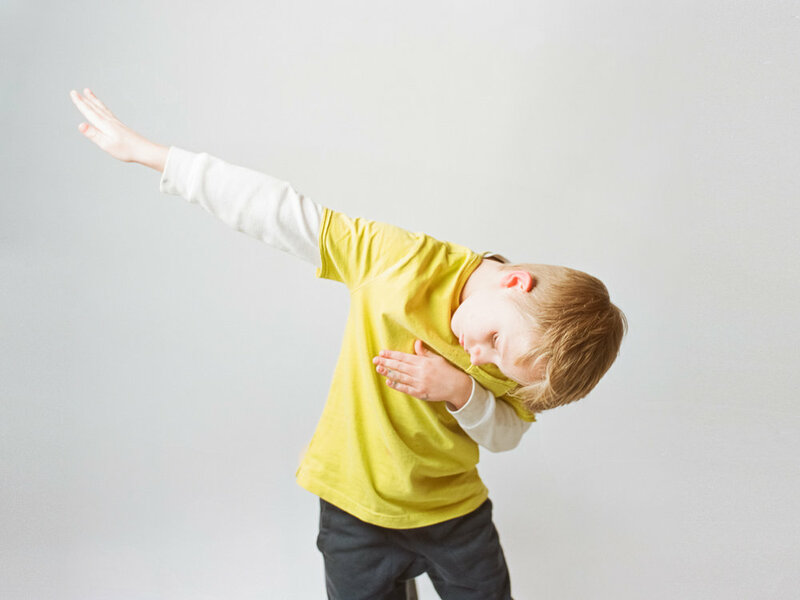 Some babies like to sleep during the entire session and some like to stay awake and party; either way is great because we’re more concerned with capturing your baby’s personality and not contorting your baby into the pose du jour. It also means there’s no strict ideal timeframe to have your baby photographed. (Highly posed newborn shoots are ideal during your baby’s first 10 days of life.) With lifestyle shoots anytime is ideal; if you realize you want “newborn” photos after your baby is two weeks, one month, three months old, etc. that’s okay! 3. You don’t need to have a meticulously clean house or a house whose style is straight from a magazine. Sometimes clients get nervous about their house not being large enough or “pretty” enough, which I understand, but let me assure you none of that matters. Can you make your bed and tidy up nightstands? Then that’s all you need! We spend most of our time on the master bed with some in Baby’s crib (if you want), and maybe on the couch for some variation. My concern with photographs is capturing the love and emotion, not the scenery. 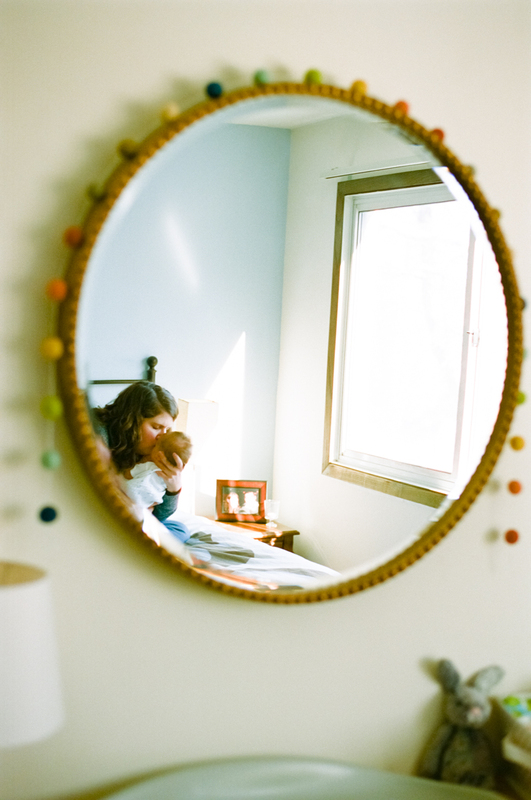 There’s something so real and so intimate about capturing the story of your family in your own home. So trust me and my vision when I say that photos in your home will be beautiful. If this sort of relaxed and emotion-filled style of newborn sessions appeals to you then we would make a great match. The tradition has continued as our brood has grown from 1 to 2 to 3. Not only do grandparents love pictures of their grandkids but who doesn’t love receiving mail that’s not an ad? Amiright? 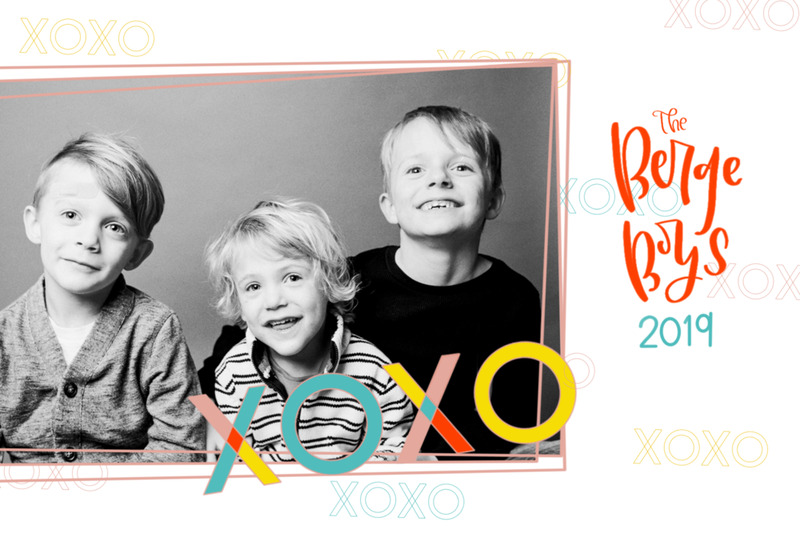 The tradition includes designing a card every year and forcing my children to pile together and smile ONE TIME for the camera. I design them to be printed on a standard 4x6 photo at Costco and I purchase envelopes somewhere on the internet. Super easy! 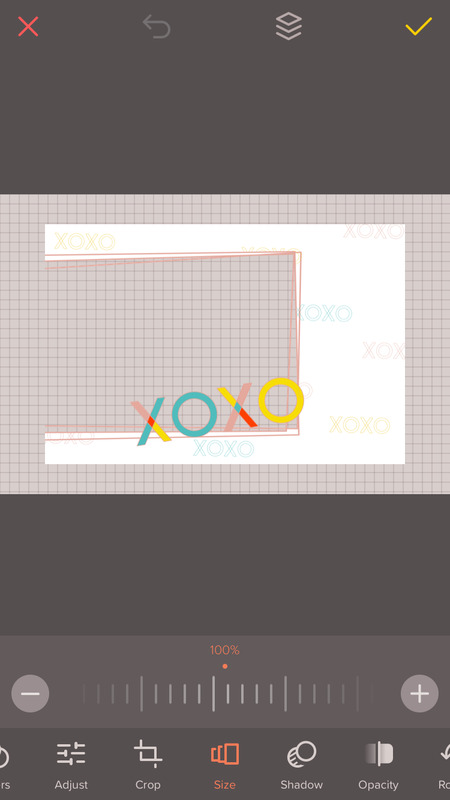 I used the Procreate app on my iPad to design the template but all you need is a smartphone to use the template! If you have Photoshop, then use that because it will be super easy to drop in a photo and create text on the side, but if you don’t have Photoshop I found an alternative for you. You too can Valentine in 2019! The template is a PNG with a transparent background, so you’ll need something that can layer files and open PNGs. The app I found on my phone is Over , which is an app I’ve had for years. They have a free version, which is all you need to complete this project. Once you have Over and a picture of your kiddos(s) or yourself (because your grandparents would also appreciate a picture of just you, trust me) you’re ready to go. 4. 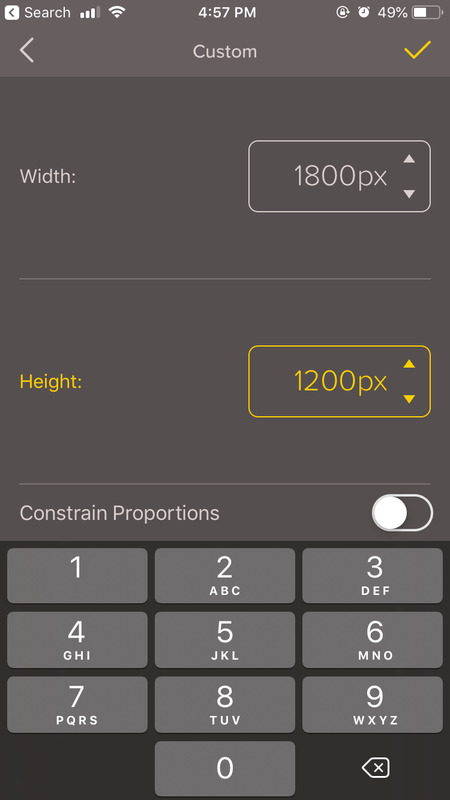 The app will then ask you to choose a background; select the transparent option. 5. It will automatically create a square for you. To change this to 4x6 dimensions, tap on the dimensions on the top of the page. 8. Select the check mark on the upper-right-hand to continue. 9. Click “image” to open up your camera roll and select a photo of your kid(s) (or yourself). 10. Click “image” again to select the template. 12. Go to layers (the icon on the upper toolbar to the left of the check mark) and select the photo to position it into the opening of the template. You can also move layers around to bring some forward or backward depending on what you need! This is an extremely handy feature. 13. Select “text” on the bottom to type the text you wish to have on your Valentine. 16. You can also play around with the letter spacing and line spacing to make it have the look you’re after! When I made a sample from Over, I ended up using the “Hello Beautiful” font for Berge Boys and “Lulu Outline” (the third version down for a thicker line) for 2019. 17. Last you hit the arrow on the iupper-right-hand side to save to photos. You’re now ready to order some 4x6s! I usually order these at Costco because the quality is much better than other fast labs and they will be done in about an hour. found some envelopes on Amazon that are red and will fit 4x6 photos. You can find them here. I also turned the photo black and white so as not clash with the colors I chose. 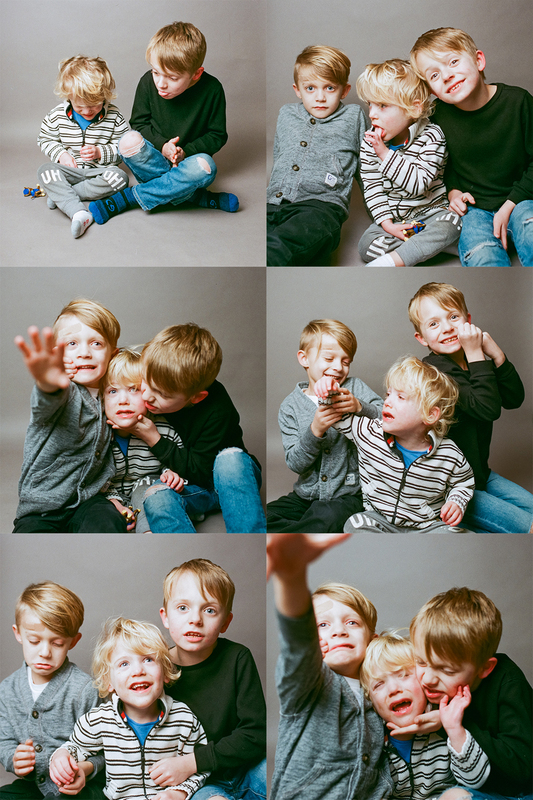 Lest you think it’s easy to get a smiling photo of my boys, I leave you with these outtakes to make yourself feel better. 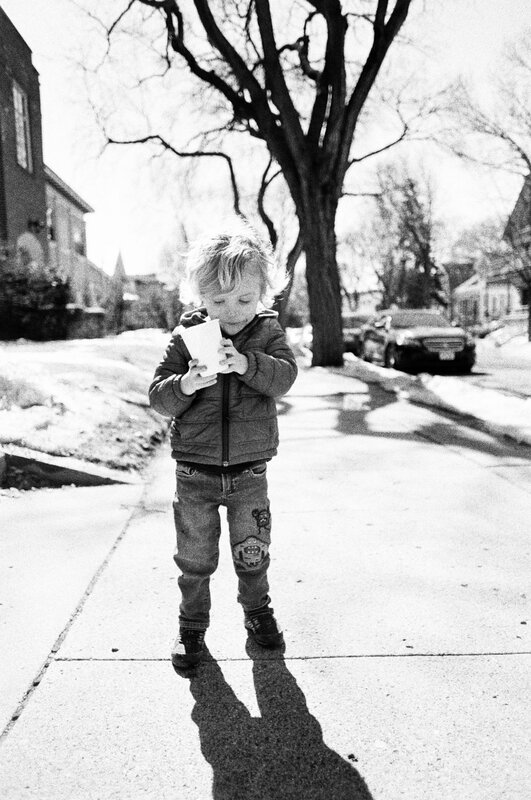 About a month ago a friend of mine brought up the idea of doing one roll of film each month, focusing on one kid in front of the lens. 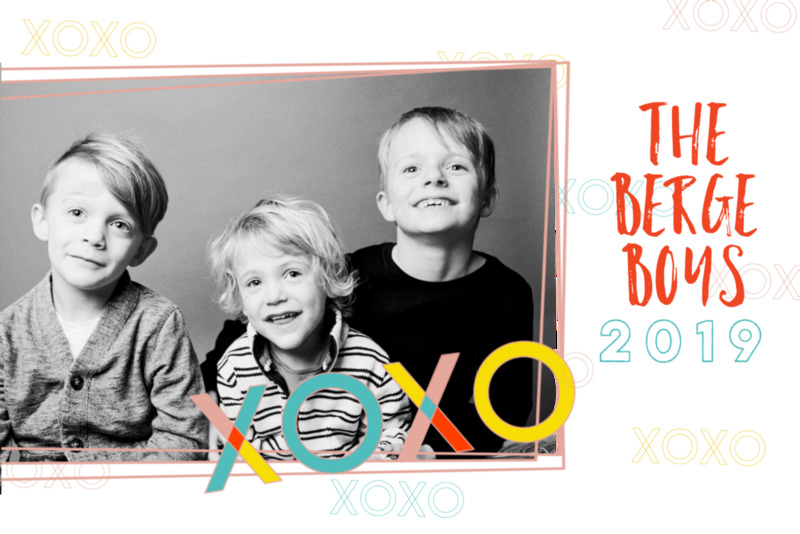 I loved this idea because it’s hard to get the motivation to force one of my unwilling children to get in front of my camera but I always LOVE the results. It’s a time that lets their personalities shine without the distraction of someone else next to them harassing them. January can be sort of a depressing month but I got excited about setting up my portrait “studio” in my basement and going to town. (Don’t get me wrong, winter light is 🔥 but asking my kids to get in front of my camera AND do it out in the cold is mighty ambitious.). I also use the strobe/umbrella set-up for in-home sessions when I don’t have enough natural light. I will say that strobe and film were made for each other. I used this same basement studio set-up once with digital to test it out and it was crap. I asked one of my strobe guru friends and she said that for digital and strobe to shine you need as much ambient light as possible. Well the shots in this post had ZERO ambient light. They were taken when it was dark outside, in a basement, with only my strobe illuminating the shot. For this first month of the project I over-achieved and did portraits of all of my boys. I can tell you right now this won’t happen (m)any other month(s). But I’ll take it when I can, and somehow I was able to convince them all to sit solo and get their photos taken. All of the photos were taken on my Nikon F100. 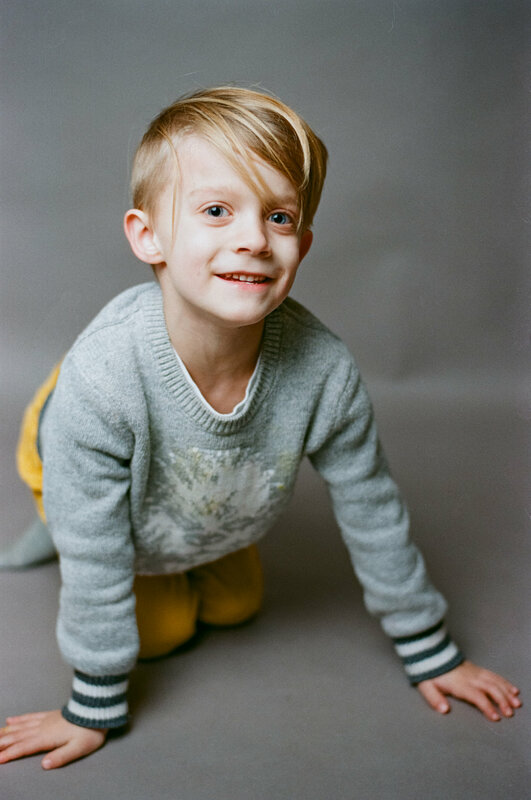 The photos of Kyle were on Kodak Color Plus 200 and the photos of Peter and Gregory were on Fuji Superia XTRA 400. All self-developed and scanned on a Noritsu LS-600. Click here If you want to learn more about developing your own C-41! There’s a whole crew of us taking on the One Roll, One Kid project! Be sure to check out Dena’s dreamy take on the January challenge! We all know technology is the best and the worst all at the same time, and I was hit with that reality in December of 2011 when I lost that entire month’s worth of photos. Yes, it’s sad, but no, it’s not the end of the world. What made this month a little sadder than losing photos from other months is that it was the one in which my eldest experienced his first Christmas and was baptized. Those photos are most definitely gone forever. I even had a backup system in place and I talked to multiple tech people to try to recover the files to no avail. My husband and I took that experience to truly learn what a backup system looks like. The gold standard is the 321 backup rule: keep 3 copies of your data, store 2 copies on different storage/media, and keep 1 copy offsite. First, let me sing Blackblaze’s praises. I love them! They back up my entire computer AND any hard drive I connect to my computer automatically. My favorite part is that I can restore my entire computer or I can just go into the system and search for a one-off photo or file. The layout of the interface is exactly like the one on my computer so it’s incredibly easy to find something stored on their server. I was using a similar service for years when all of a sudden they decided to shut down their site to personal users (yes, super wack). This unnamed site recommended an alternative that was expensive and I was nervous I’d never find a replacement. Enter Blackblaze. It’s cheaper than the other site I was using, has unlimited storage, and I like the interface better. If you’re looking for an automatic backup to a cloud-based service, I highly recommend trying them out. But my very favorite backup for photos are my photo’s negatives. They’re a physical copy that has spanned the test of time. Their archival quality means they will last for generations and throughout the years, from enlargers to scanners, technology has consistently been created to be able to read the information on negatives. I’ve been creating photo books lately to catch up on archiving my family’s pictures (more on that in another post) when I ran across 5 photos that my computer couldn’t place. I looked on my external hard drive (absent), I looked on Flickr (absent), I looked on Blackblaze (absent because I didn’t properly migrate over to them when my former site shut down. Oops.) So you know what I did? I just located the negatives of those photos and rescanned them. If not for those negatives the photos would’ve been gone forever. I realize using film isn’t feasible or desirable for everyone, but I do think negatives are an advantage people don’t always consider. I’ve met more people scared about the fallibility of negatives than the fallibility of a memory card. But I hear waaaay more often of corrupt memory cards or disappearing files on memory cards than a disaster happening with negatives. 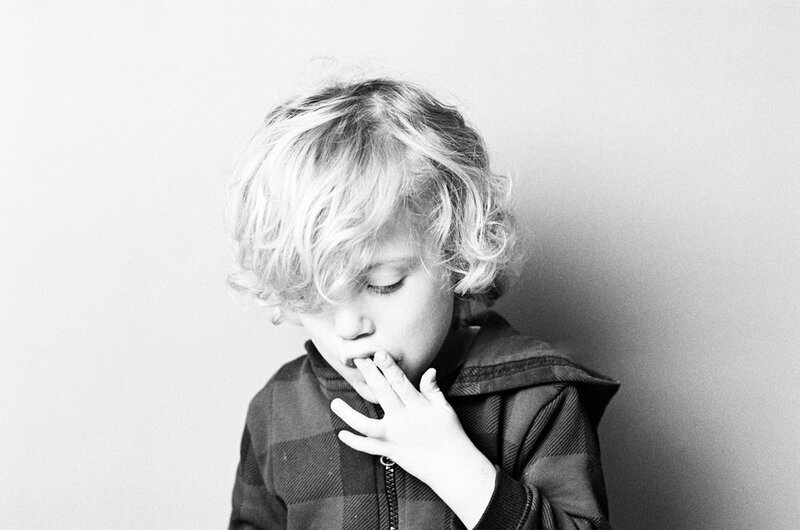 So please, don’t let negatives scare you away from having a film photographer document you. And film photographers, think twice before tossing those old negatives in the garbage. Yes, they take up room but they’re an amazing tool for backing up those precious memories. Ask yourself if you have 3 copies of your photos on at least 2 different media and 1 of which is stored offsite. If not, what’s stopping you? Because trust me, technology can and will fail you so be sure you take actions today so you keep your memories safe tomorrow. One of the images lost in the shuffle that I was able to rescan. When people find out I shoot film, I often hear a response of shock and wonder (and sometimes confusion). Sometimes clients don’t even realize I shoot film until I’m reloading during a session. The people who think it’s cool love that it’s just so retro…so analog. (It’s maybe no surprise that in my house we also have a collection of records.) And to the people who are confused, I get it. Why, in a world of digital and all of its conveniences, would I CHOOSE (on purpose) to shoot film? And you’d be right, digital is easier than film in so many ways, two of the biggies being that it’s more convenient and cheaper. Film shooters can’t chimp during a session and they have to buy film and pay costs associated with developing it and scanning it; why would anyone do this? It’s a totally fair question and I’d love to tell you why I still shoot film. A film image taken of a film camera….very meta. Dear film, you are amazing. 1. Let me clear the air of this right away: for me not being able to chimp is a feature, not a bug of film photography. When I shot digital I would leave sessions with hundreds (and I mean huuuun-dreds….sometimes over 1,000) shots taken in 1-2 hours. And it’s not because I was seeing 1,000 awesome moments to capture, it’s because I wasn’t taking the time to set up the shots I wanted to capture and then waiting for the magic to happen. This is not to say that I don’t have magical shots from my digital days, I do; I just know that if my face is behind the camera for 1,000 shots during a session, that means I’m less able to connect with my clients and that’s the opposite of my goal during sessions. Shooting film has just meant I’ve learned to become an artist with intention and that’s a win for everyone. 2. I think the real confusion sets in when I tell people that I scan my negatives so I can have digital files to edit and send to clients. Huh? Why in the world would you shoot film just to end up with a digital file? To the people who say this: you have good logic. To answer this (really good) question, let me first be briefly techie. When digital photographers shoot, most often they shoot in RAW and then take that RAW file into some sort of editing program to work with it. These RAW files are exactly how they sound; they’re like uncooked meat, they are meant to be edited before sending them to clients. This is when photographers spend money buying or time creating presets to get the look they want. I spent a lot of money on presets trying to get just the right look out of my digital files, and I was ultimately never satisfied with them; I still had to make plenty of edits after applying these presets and that meant a LOT of time in front of my computer. With film, I scan the negatives to get a jpg file but the film emulsion does the work of a preset. I get a fully-cooked file when I digitize them. And when I edit, I’m often only tweaking the brightness, white balance, and maybe contrast. My husband loves that I barely spend any time editing and I’m HAPPIER with my final result. 3. Speaking of negatives, in this age of illusive files and things living on ephemeral technology, it is incredibly important to have something tangible. Obviously I encourage my clients to print their photos but unlike immaterial files living in a cloud, negatives are tangible and last a very, very long time. 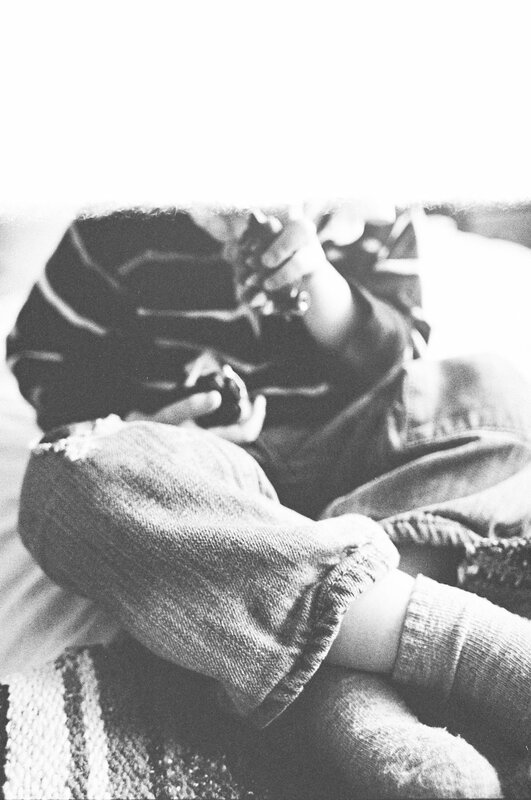 In 2011 my eldest son had his first Christmas and the digital images from that time are gone. I even had my computer backing up to an external drive, but due to the unpredictability of technology even those disappeared. If I had taken those photos on film, the images wouldn’t be lost forever because I could re-scan the negatives. 4. Film is nostalgic and imperfect and beautiful. It’s what the photos of our youth were taken on; having that connection to the past excites me. Taking photos of my children that they will cherish forever on a camera that was built before I was born and using a film that I used to buy at the local drug store when I was a teen links the past to the present to the future, and how beautiful is that? I also love that it isn’t as crisp and sharp as digital; the grain adds texture and dimension to images and makes them feel more like stolen moments and ultimately speaks to me as an artist. 6. Ultimately it’s the medium with which I best connect. Some artists connect with watercolor, some with sculpture, some with words, some with digital cameras, and I with film. No artist should apologize for the medium they love! This is it. This is the spot where you sign up for the ever-so-rare email from moi. The email that contains exciting news about offers, promos, or just general awesome information. Because trust me, I'm only going to send you emails that are fabulous.